Surprise! A young girl&apos;s dream come true. Published Sept. 18, 2018 at 6:56 p.m.
Heart of Canal Street has made more than 600 donations totaling over $18 million to hundreds of local children's charities over the past 25 years. Make-A-Wish Wisconsin has helped nearly 100 young childrens' dreams come true already. And now, with a new partnership, the two organizations aim to help even more. Hosted by Potawatomi Hotel & Casino, the two organizations celebrated their new partnership – along with Heart of Canal Street's 25th anniversary – by making another dream come true, as 13-year-old Iyanna's one wish come true as she and her family were given the trip of a lifetime to Disney World as a part of Heart of Canal Street and Make-A-Wish Wisconsin's new union. In addition to a magical journey to Disney World, Iyanna, who lives with a brain tumor, received a multitude of presents, pizza and chocolate cake upon her arrival at Tuesday afternoon's event. In addition to hosting the event, Potawatomi Hotel & Casino also announced that, through its Heart of Canal Street program, it would donate $100,000 to Make-A-Wish Wisconsin as part of Canal's 25th anniversary. 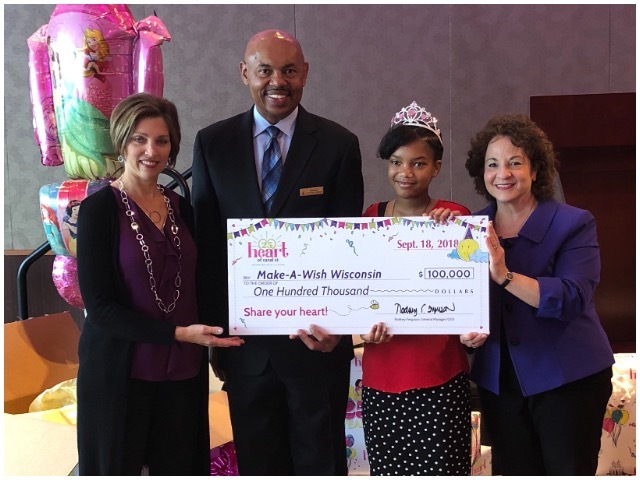 "We are such proud partners with Potawatomi Hotel & Casino," Make-A-Wish Wisconsin President and CEO Patti Gorsky said. "Today's generous donation allows us to ensure 25 life-affirming wishes will come true." A great day to celebrate a generous collaboration and a brave, young girl.